From a very young age, my earliest memories are traveling the world with my parents and later my two brothers. My love of design was always with me. With my sketchbook and camera in hand I embraced every moment of the various travel and cultures I came across. With three of us under 5, I really don’t know how my parents did it. it must have been physically and mentally exhausting for them! Looking back though, what a wonderful opportunity and fun we all had, growing up with a father in motor sport, it brought its own unique way of living. “Why hang a piece of art on the wall, wear it, Why be normal be different,” Unique Wearable art and designs. Life generally came with its highs, and its lows, that was the name of the game, especially in the 80’s in Formula 1. I have learnt to continue to embrace those early opportunities, as they have moulded me into the person I am today. My creative side and my passion for design were always very apparent in my life. I have been fortunate to worked in many different areas of design. Starting out life as a junior designer for Poole pottery, moving on to my own ceramics and jewellery company ‘ Chloe Ceramics’. I then continued to build my knowledge and completed an interior design course at ‘Inchbald ‘ in London. That then led me to full fill my bachelor’s degree in business and fashion design. Taking me out to Tokyo to work for Paul smith. I’m born passionate and creative person, and that’s what gives me fulfilment out of life. London based, I now design my own collection of one off pieces. These consist of a variety of designs working in Ceramics to precious metal, and Fashion collections. 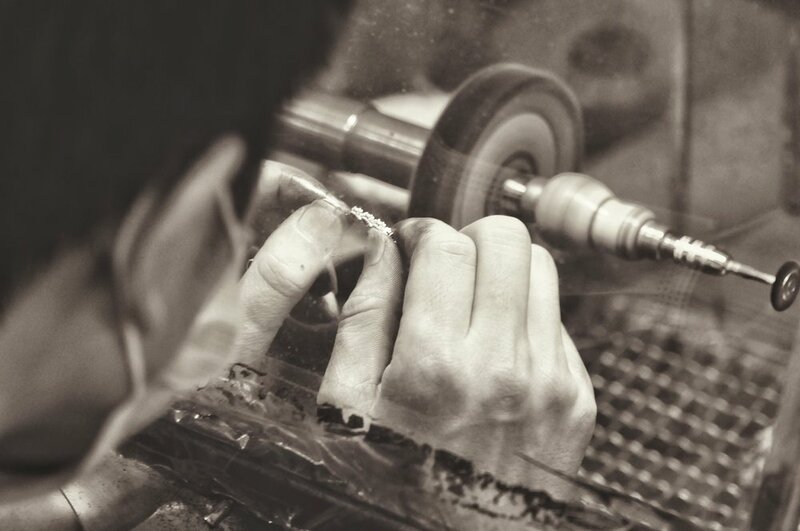 Each item is carefully designed and constructed by hand.Using a variety of different metals ranging from sterling silver to Platinum and Yellow and Rose Gold. All of the stones are hand painted ceramics. Each piece of our hand made pottery goes through several painstaking processes. “Active Glazes” move at very high temperature to produce remarkable effects, which are always individual in their detail, making each piece unique. All made in England. I’ve always had a passion for creating bespoke unique garments. Working with a range of different fabrics, and textiles. All of my items have an individual feel, as they are all handmade. Carefully paying attention to detail colour, shape and style. Not one item is the same. I offer a bespoke made to order service. This is what I like to concentrate the majority of my designs on. I usually work to a 4-week delivery for that unique piece. Always looking for something different, whether is may be a Van Gogh Silk print used in a gilet jacket lining. The options are never ending.